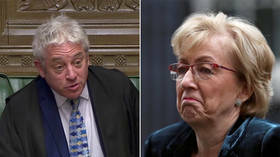 Calling the ongoing squabbling in the House of Commons “party political hackery,” Speaker John Bercow told an interrupting Tory backbencher to “grow up” and had a sharp exchange with Leader of the House Andrea Leadsom. Do grow up, for goodness sake. This is not a matter of party political hackery. Let’s have some seriousness of purpose and mutual respect... let’s raise the level. After Bercow had disciplined the parliamentarian, urging the British lawmaker to conduct themselves with “some seriousness of purpose and mutual respect,” Leadsom delivered a rather curt response to the speaker. Mr Speaker, may I just say your response does not raise the level [of respect], but I’ll leave it there.